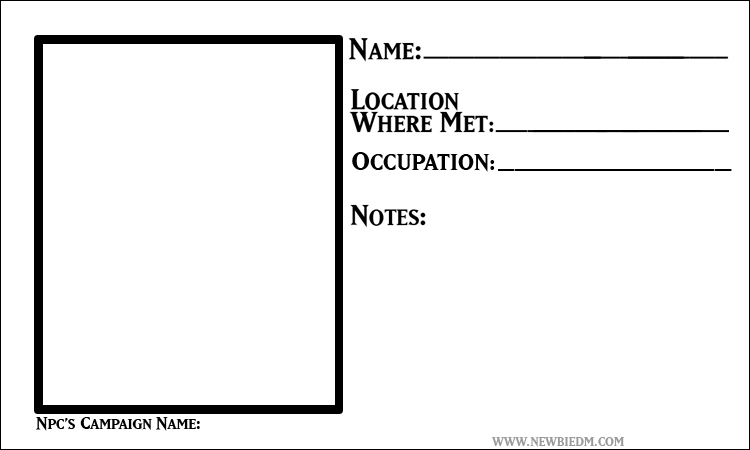 I was talking to one of my players today, and he casually mentioned that sometimes there were too many NPC’s to remember in my game, and note taking is not their thing… so I decided to come up with npc cards. These are simple to use. The Photoshop version has a “hole” where the portrait goes, so you’d drag an image in photoshop unto it, and make it the bottom layer, then just resize it. It’ll show up in the hole. They are simple, not too fancy, but may be useful. Find images from your modules or adventures for the NPC portraits. ← Warstories: Eat, Drink, and be Merry…. I think I would add a field titled “Occupation” so that the players know that Avanathemon is the Erathis high priest and Armillary is the beggar. That way your players instantly know “Oh, he’s that beggar dude we met.” I can’t think of any reason why you wouldn’t want to include some sort of identification like that, so it seems like having a field specifically for that would be helpful rather than always having it in the notes field. You might also consider an “Allegiance” or “Affiliation” field if you have a game of political intrigue so that the players don’t help the wrong side because they forgot who an NPC worked for, but that might not be necessary in a standard D&D game. All in all, a great idea. I just might use it for my game! I think I’ll give them out to say “this person is important”, but I’m not sure if I’d write stuff in the notes field or if I’d just let them do it. I just print out redacted versions of my own NPC note sheets for the players. Zero extra work, unless you count stapling it (this step is essential). I kept them as simple as I could on purpose. everything else is stuff that may or may not be important… the notes section should suffice for most NPC’s. Just a couple of bullet points really… you don’t want to fill this thing up with a wall of text either. That makes more sense. I thought the problem was that your players didn’t take notes, though? Right, but maybe having a card w will motivate them to be a little bit more organized. Plus, other people out there will use them, not just my guys. Cool idea. I’ve struggled with players not taking advantage of my online material, so perhaps cards might be a good alternative. 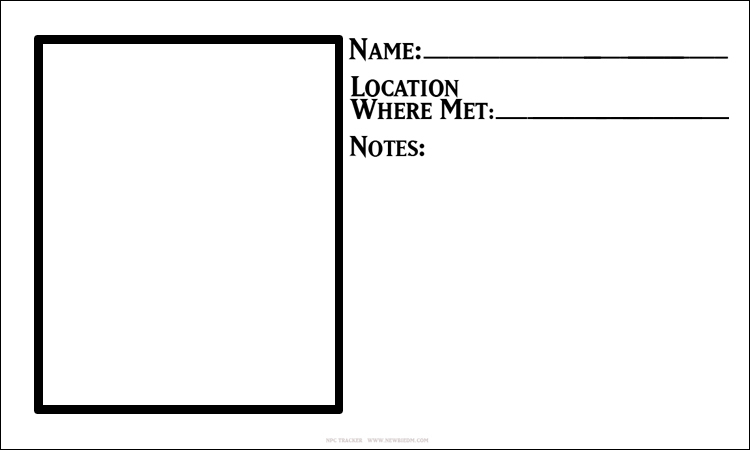 I’ve found some pre-perforated 3×5 index card sheets for laser printers that work pretty well for encounter cards for DMing, so maybe I’ll create an NPC handout card template for players. A PDF form should work, eh? I think these are fantastic! I’m thinking of printing off a few dozen of these, putting them into one of those CCG Portfolio books, and having the players fill them out when they meet an NPC that might be important to them. Then, I’ll slip them back into the book, so when the players encounter the NPC again and say, “wait, who is he?” I’ll just pull the card out and they can see everything they wrote about him.